Your Support Counts: Surodi Village Transforms itself! Surodi is a small village (population 700) in drought prone Ahmednagar district of Maharashtra. With a total support of $15,000 from AID during 2001-2007, Surodi villagers built small cement, stone and mud bunds and checked soil and water erosion. Water table rose and trasformed the agricultural scene in the last 3 years — its wells have filled up, the production of milk in village has increased 8 fold. Last year Surodi villagers sold Rs 40 Lakh of onion. Today there are 7 tractors, 70 motor cycles and 50 mobile phones in Surodi village. Surodi is small village (population 700) in drought prone Ahmednagar district of Maharashtra. The Taluka headquarter Shrigonda is 12 km from the village and the District place Ahmednagar is 55 km. The agricultural area of the village is around 650 hectares. The average rainfall in Surodi is 350mm per year. The literacy rate among villagers is around 50%. The schooling in the village is only upto 4th standard. Since the average rainfall in village is only 350mm per year, most of the people were engaged in agriculture in rainy season only and the rest of the time they would go to nearby village to work on a daily wage basis. Before the watershed there was 8.51 hectare irrigated land and 125 hectares seasonally irrigated land in the village and rest of the land was rain fed. Therefore, the average income of the villagers was very less. The parents sent their children to school up to 4th standard (in village the schooling is upto 4th std). Some parents sent their children, especially boys, to nearby village for higher education but most of the children helped their parents earn some income. Since the population of the village was very less, the politicians ignored it from developmental schemes. There was no state government bus transportation to Taluka and district places. There was no clinic or post office or bank or any other essential basic facility. That the village was ignored by the government to provide basic facilities, came as a potentially positive aspect for the village. Since the village population is very low, the villagers tend to develop commendable attachment with each other. There is reasonably good harmony in the villagers of different casts, creeds and religions and all take part enthusiastically in each others affairs and functions. In the year 2000 a group of youth in village conducted several village meeting and discussed several plans for village development. We came to a conclusion that we should organize an educational trip to visit and study an ideal village Ralegaon Siddhi. On Oct 27, 2000 we conducted a tour with 50 villagers to see Ralegaon Siddhi and arranged a meeting with Anna Hazare. Anna told us that if we wanted to do something to develop Surodi we should start from watershed development. He happily shared his experiences. Anna motivated villagers and after coming back form Ralegaon we immediately started watershed development work in our village. Villagers were ready to do voluntary work but we didnï¿½t have money to purchase cement and sand. We discussed this plan with Vidnyanvahini’s members. They liked the idea very much and gave Rs 12,000/- in personal donations. With this money, we repaired one cement bund and made one new bund. Next monsoon we had very good rain and two bunds were filled completely. Next four months wells nearby these bunds were recharged and people understood the importance of watershed development in our village. In 2001, we conducted one more trip to Ralegaon Siddhi with 65 people. Again we saw the watershed and other developmental activities. Anna Hazare gave us some very useful suggestions. Anna told us that one or two bunds were not sufficient for village watershed development. He suggested that we should harness maximum rain water in village itself. Next year with help of Vidnyanvahini we conducted a detailed survey of watershed in our village and submitted a proposal to Association of India development (AID.) In the meantime Ravi, Aravinda and Shoba from AID group visited Surodi and saw actual situation in the village. AID group donated $6000 (six thousand US dollars) to the village. This financial support got villagers very happy and they collected about Rs 40,000 (forty thousand rupees) and voluntarily worked for the next three successive summers. Past three consecutive years we got good rainfall. We got very positive effect due to watershed development in village that harnessed the rainfall and resulted in a very good agricultural yield. The Financial, Educational, Health and Social situation of villagers has improved. Since 7 years there is no election in our village. The Sarpanch and chairman of the Village Co-operative Society were elected unopposed. There is no liquor selling in the village since last 7 years. The production of milk in village is increased from 100 to 800 liters. Now there are 7 tractors, 2 JCB machines, one Tempo and more than 70 motorcycles in the village. Earlier there was no communication facility in the village; now we have more than 50 mobile phones. Last year Surodi villagers sold Rs 40 Lakh of onion. Many day wage labourers and those bonded in labour now own cattle, sell milk and have become self-dependent. Villagers Surodi and I, wholeheartedly thank AID group and Vidnyanvahini for supporting us. I am sure that in next few years Surodi will be transformed as a self sufficient village. Ashok who hails from the Surodi village, is an extremely motivated and talented young man, who inspires children in goverment schools in several districts of Maharashtra via demonstration of science experiments through Vigyan Vahini (founded by Dr. Madhukar Deshpande). 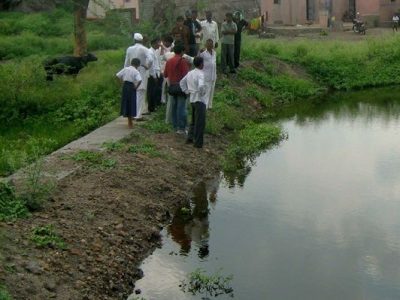 Being deeply committed to transform his native village, he proposed to Association for India’s Development (AID), the watershed project since Surodi village in drought prone Ahmednagar district and its agriculture suffered. AID volunteers quickly grasped the importance of Ashok’s proposal and the AID-Pittsburgh chapter extended financial support over a span of few years. Several AID volunteers have visited Surodi during the course of the project execution. We are extremely happy that the watershed efforts have proved so successful for the Surodi villagers, and for the guidance given by Anna Hazare whose work in Ralegaon Siddhi in the same district, has been an inspiration. Ashok led the work in Surodi village with assistance from Vigyan Vahini and we congratulate him ! -Ravi and Aravinda, for AID.